Product #16079 | SKU MBMA-H-L | 0.0 (no ratings yet) Thanks for your rating! 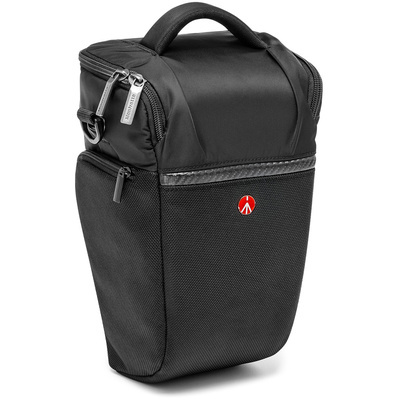 The large, black water-repellent Advanced Holster L from Manfrotto holds the bare essentials: camera, memory cards and few accessories. Top opening gives fast, easy access to the camera. Advanced Holster S is designed to carry and protect a DSLR camera body with 70-200mm lens attached and a few accessories. There are 2 side pockets for small accessories and an interior Modular Media Pouch for memory cards or batteries. The bag is carried by a handle, a detachable shoulder strap or belt connection loops.